Multi-document & multi-party workflows for employees, customers and partners. Always Available Wordwide Since 2001! Millions have switched to eSignForms. You can, too. Why settle for being just one of millions of users controlled by a monolithic, closed system? Secure a brighter future now with your own open, fully independent E-Sign Service. The commerical license fee applies to all deployment options. It includes the software, all subsequent upgrades, as well as technical support. Refunds provided for any unused months of prepaid service. Talk with our experts before you pilot. We only succeed if you love us and renew! Unlimited users, transactions, signatures, packages, parties and documents. You get all features in all plans, including branding, integration and APIs. Your digitally signed HTML and PDF documents are easily downloaded by all parties. The eSignForms database size calculator should appear here. This calculator allows you to estimate your database size. A typical 1-page document may use about 30KB. 100KB per transaction is a reasonable estimate if unsure. Use 2500KB for HR onboarding packages with many documents. Choose the one that suits you best. Shared and private hosted service includes all server and network operations, OS updates, 24x7 monitoring, firewalls and security scans, as well as off-site storage of encrypted backups. Regardless of the deployment option selected, your service runs in its own distinct web application and database unlike competing Software-As-A-Service (SaaS) providers that co-mingle all of their customers users and data in a single service. Shared hosted: Has a non-refundable $100 setup fee, but no additional hosting fees apply. Your service runs on a Yozons-provided and operated server along with other shared hosted customers. Private hosted: Has a non-refundable $250 setup fee, starting at an additional, non-refundable $1200/year for a 2GB RAM server (4GB, 8GB and 16GB also available). This service runs on a Yozons-provided and operated server for your private use and uses your domain name and SSL certificate. On-Premise: Has a non-refundable $400 setup fee, but no additional hosting fees apply. This service runs on your server running Linux (Red Hat, CentOS) that you own and operate in your data center using your domain name and SSL certificate. To maximize your ROI and reduce risk, we recommend you start with a smaller database size and expand when you succeed. It's easy to migrate between any of the deployment options above, so we recommend piloting with shared hosting. Buy NOW using a credit card or contact us for a firm quote. NON-PROFITS: Yozons offers a free bump up in your preferred license size so you get more for less! Your satisfaction is guaranteed. If you terminate early, Yozons will provide a refund for any unused months of service. It has never happened, but if our software were to fail to perform during the first 90 days, Yozons will refund all of the licensing and setup fees. While Yozons has not paid to be "accredited" by the Better Business Bureau (BBB), we are proud to have earned an A+ rating. The only complaint filed against Yozons since our founding in 2000 was a case of mistaken identity:	the complaint confused Yozons with one of our customers. Of course, Yozons provided all the help it could to resolve the dispute with the correct party. Build your own forms using our WYSIWYG HTML editor, or tailor ours to suit your needs. Let our e-signature experts build your documents and workflow to get you started quickly. Fixed price with quick delivery of pre-built forms listed below. Reasonably-priced, fixed-bid custom development available. Interest free payment terms available. Please be a good demo user and either use your actual email address (nobody here mines email addresses used in the demo system) to see the emails working, or anything-you-want@example.com so emails aren't sent to bogus email addresses that could belong to others. General contract/agreement - 1 page, 3 parties (sender, signer, co-signer) FREE! Sender enters contract/agreement terms and conditions, specifies a signer's email address and an optional co-signer email address, and uploads optional attachments. The Signer receives an email link and reads and signs. If a Co-Signer email was specified, the Co-Signer receives an email link and reads and co-signs. Secure records transfer - 1 page, 4 parties (sender, recipient, CC1, CC2) FREE! Sender enters notes and uploads various documents that need to be transferred securely, such as for HIPAA or PCI compliance, as well as specifies a recipient's email address and one or two optional "CC" email addresses. The Recipient (and optional CC recipients) receives and email link and can retrieve and download the attached files. As always, all data is encrypted on disk as well as when transferred over the Internet to ensure your privacy. e-Docs - 1 page, 1 party (uploader) FREE! Uploader adds notes or any electronic files, such as scanned faxes, PDFs or other images and associates it with a project. Up to 3 email addresses can be notified when this electronic record is created. This "e-doc" form is used to store documents received outside of eSignForms into your secure repository for easy access via reports. Employee fills out name, address and citizenship status and then signs. Employer verifies identity documents and optionally attaches scanned images of them and then signs as the witness. Employee fills out name, address and number of exemptions and then signs. Taxpayer (vendor/contractor) attests to business name, address and EIN/SSN and then signs. Individual (vendor/contractor) attests to foreign tax status and then signs. Company fills out the other company's name, address and email address of the party, as well as signs for the company. The recipient receives an email, reviews, initials page 1 and signs on page 2 at which time the finalized PDF is sent to the Company party who started it. With Point & Click Programming, anybody with basic web skills can build their own forms. Get started with our step-by-step Programming Tutorial and Programming Guide! If you prefer not to do it yourself, Yozons offers a turnkey solutions using your existing documents to create web-friendly versions. The Yozons eSignForms custom forms calculator should appear here. This calculator allows you to estimate custom forms development costs. You may estimate custom forms development costs based on the number of pages ($300 per page) of your document and how many parties or discrete steps will be involved in processing the document (first party included, $150 per additional party), including initiators, signers, countersigners, approvers, witnesses, etc. Note that parties who simply receive signed copies or view them through online reports should not be included. Please contact Yozons for a firm quote based its review of your documents and your business process. Talk with our experts before you pilot since we only succeed if you love us and renew! Working with Yozons - We strive to be fair to all of our customers, big and small. You can build your forms yourself and save custom development fees. See our How-To Guides for details. Quality custom software development takes time, typically 2 to 4 weeks, sometimes sooner. When you purchase custom work, your job is put on our development queue. Expedited delivery at twice the standard rate may be purchased depending upon programmer availability. Custom development does not begin until payment is received. A single point of contact at your company to authorize all work ensures a smooth process for the initial implementation as well as subsequent support. Some customers choose to have Yozons develop the initial online forms and then make subsequent changes later themselves. Or use our documents as a template for your other similar documents and workflows. If you need custom software or services from Yozons, we're happy to do so with pre-paid professional service hours. Our hourly rate is $250 per hour, billed in 15-minute increments, with discounts for multi-hour purchases. Yozons™ employs industry accepted, standard technologies, including RSA public key cryptography and XML digital signatures in a web-based architecture. Our patented technologies remove the complexities of public key infrastructure (PKI). Yozons software creates and manages digital signing keys (without cumbersome and expensive digital certificates) and encryption keys internally so that you and your customers and associates don't have to, nor do you have to worry that such keys are accidentally lost. Our data centers (Amazon, Rackspace, DataPipe) have passed SSAE 16 Type II SOC 1 (and ISAE 3402) examinations. Documents and forms displayed and completed online are written in standard HTML and can be used by any web-enabled device, including desktops, laptops, tablets and phones. Copies may be downloaded as a PDF when preferred. Standard Commercial Software Disclaimer: Our technology is not suitable for military use, or for any high-security, high-risk, life-or-death purposes. We protect your investment by using open, industry accepted standards. Read more in our Frequently Asked Questions (FAQ). And learn more about Electronic Signatures and Digital Signatures. Yozons prides itself on its personalized customer service and support. Please contact us for more information about our products and services, as well as to discuss how we can help you succeed with the absolute best web-based solutions for tailored electronic signatures and e-contracting at any price. Yozons™, Inc. provides high quality, commercial-grade, secure, trusted electronic signature and e-contracting services to a select set of discriminating small, medium and Fortune 500 companies. Our products have been field tested in a large variety of different markets by customers since 2001 after we invented "digital certificate-less" web-based electronic signing technology. Yozons is a unique technology provider that continues to grow organically every year via referrals by servicing the needs of our customers. If you prefer mass marketed offerings from the likes of Microsoft, McDonald's and Budweiser over those from Linux, local restaurants and brewpubs, our small business may not be right for you. We e-work to live so you can too. We're dedicated to enabling businesses of all sizes to succeed by providing powerful e-contracting and electronic signature technologies. Read more about what our customers are doing with our technologies in our Enterprise WebApps blog. Yozons is proud that it's owned and operated in the United States of America. The unusual word YO-ZONS means "swift motion." In World War II, the "Code Talkers" radioed their coded messages based on the Navajo language because it was not decipherable by the enemy and helped win the war in the Pacific. In this vein, Yozons ensures that business documents can be shared and "Yo-Signed" quickly without fear of unwanted eavesdroppers. Each customer gets a unique, private, commercial-grade e-signature web site, including its own web site URL, which can be in its domain if desired (i.e. esign.yourdomain.com), and its own independent web application and database. Unlike other services, you are not just a user of a large third-party system that controls your data. Our patent invented server-centric key creation, management and use for digital signatures with dynamic user authentication. If end-users are not using a digital certificate or managing their own keys and generating their own digital signatures, the software likely infringes this patent. All of our customers are companies, be they departments in large corporations, or small businesses. We rarely deal directly with consumers and we do very little advertising as we work primarily through referrals and partners. We've relied on satisfied enterprises to drive our innovation and revenues since 2001 rather than depending on investor-fueled self-promotion and low quality freemium gimmicks. Full customer branding: URL, logos, all email notifications, etc. We have found that only disreputable businesses intend to confuse and cover their tracks by hiding behind the service provider's brand. Also, when you entrust your business with another company's brand, you run the risk of virus infections inside your business as well as those you contract with with, in particular with phishing attacks. Customers can start with our shared hosting service running on our servers that also runs the application of other customers; or they can upgrade to a private web hosting server (and have their own domain name and SSL cert) where their server is not shared with other customers; or they can run it on their own server in their data center. Flexible deployment is a key enterprise feature because companies often start a pilot with the shared hosting services, and then roll out big time on their own server. Or if they are like many big companies who have difficulty getting their IT to do these things in a timely manner, they can run it on one of our private web hosting servers. We can do this because each customer's deployment is fully independent, and thus we can backup their application and database and migrate it easily. A single customer account can be used to manage multiple partners/channels or even their own customers (reseller). While those partners will share our customer's branding for the deployment itself, each of the other groups can send out documents/forms/emails that are branded to them (showing their logo, company name, address, phone, etc.). All documents are fully encrypted when stored on disk. The data inside the documents are independently stored (your data isn't locked inside a document) and are fully encrypted. Transactions operate on packages that can contain one or more documents that flow between one or more parties, with custom actions (like sending an email, changing data values, sending notifications to back-end systems...) at any step. Data on a form can be visible to one party, but masked for another; required for one party, but optional for another. Documents in a package can be visible to one party, but not available to other parties, or the other party may only have view-only access. Documents in a package can be automatically removed if they are not needed in all circumstances. Parties can be skipped if they are not needed in all circumstances. Custom reports can be created that show selected data from your forms, and that data can be exported as Excel or CSV files for further analysis or integration. These reports also allow users to keep track of the status of all transactions. We charge on a database size license, so there's no concern for per-transaction fees, or per-document fees, or per-user fees. One heavy user or 10 light users only pay based on how much data/documents they store in their database. All of our customers get all of the features available. There are no extra fees to make use of advanced features. We are fully web-based in that all of the documents are native HTML (standard XHTML actually). This allows it to render correctly and natively on any browser on any device without plug-ins. Also, such documents can even be read by humans in their native format (for any extreme legal challenge), unlike a Word or PDF file. HTML files are also dramatically smaller in size. Because documents that are signed are in HTML, we are able to capture the exact HTML sent to the user when they sign, giving us the ability to digitally sign that document precisely as they saw it. Of course, our customers can convert and combine HTML documents to PDFs on the fly, such as if they email or want to print a set of documents or store them in a legacy document management system. We even support TIFF exports. Our audit trail consists of digitally sign documents and digitally signed data (the separately stored XML data that populates the form fields) on each step from start to finish. Of course, it also includes traditional activity logs that record user's IP address, web browser type, accurate timestamps, etc. Our forte belongs to customers who repeatedly sign the same type of document/form as they need to set up the document once, and then all of their users can use it as frequently as necessary without having to worry about any errors in the contents of those documents. We are able to deliver an ever increasing number of pre-built forms/documents so customers can make use of them out of the box, yet they can also tweak them as necessary for their individual needs. We already offer the federal W-4, I-9, HIPAA-compliant Business Associate Agreement, etc. 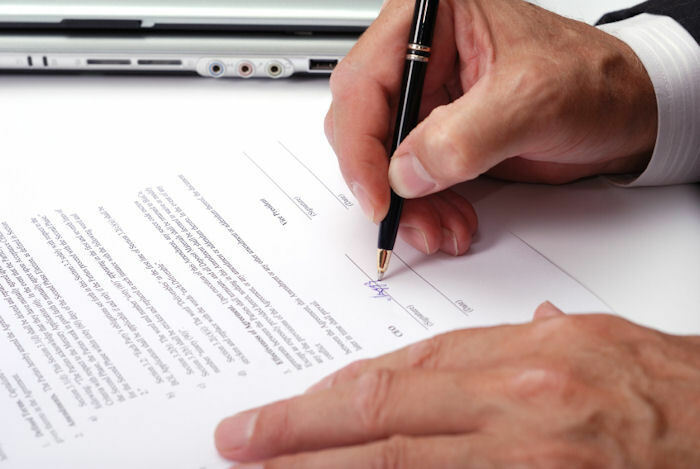 And we also offer a flexible "build your own one-time agreement" so a user can just type in a contract (or copy it from Word) and get a signature on it without having to program anything. We can offer pre-built forms because the document and related configuration can be exported as XML so it can be imported by others. All of the software programming for custom forms and process flow is done using the web application itself. No traditional programming is necessary. Yet you can change field values, perform calculations and do conditional logic. We offer a simple Test and Production version control system. This allows documents to be created or updated and tested without impacting production transactions, and when ready, they can be put into production without any downtime. It also allows you to run Test transactions without cluttering/mixing such transactions with real transactions. We offer a To Do list that shows all transactions pending for a specific user or a group of users. Every email sent is recorded, and if there's a bounce or reply, it is automatically correlated with the original email. Our user management allows for unlimited numbers of groups to be created, each containing one or more users. This also allows a manager, via the reports, to have access to all transactions of the people he/she manages, while allowing regular users only the ability to see their own transactions. Our digital signatures are based on 4096-bit RSA key pairs (server-generated and controlled per our patent), SHA-512 and XML Digital Signatures. Nobody is more powerful and secure in terms of the keys and the hashing. Our data encryption uses 256-bit AES so even if you walk away with our disk drives or a copy of a backup, the data is secure. Our users can choose pass phrases up to 100 characters (letters, numbers, special characters, etc. ), and we never store the password in our system so it can never be leaked. Clear, fair and predictable prices for easy budgeting, rather than per-use or per-user. This allows you to start with minimal financial risk no matter how big you expect to grow. No pressure sales and no long term commitments ensure you only buy what you want for as long as you want. We don't use slick marketing or bait-and-switch to hook or trick. Some competitors will take any and all customers, often luring indiscriminate users with free gifts and free beginner services, with the misconception that growth at all costs makes them winners. Yozons does not accept or keep customers that operate in unethical ways or are belligerent because of their management "style" or previous bad experiences with other vendors. Yozons provides unparalleled service to customers who are professional, ethical and seek mutual success. Yozons believes there are better places to visit than Fisherman's Wharf in San Francisco, Waikiki beach in Hawaii or even Starbucks for coffee in Seattle. It's not that these places are bad, just that you'll rarely find gems among the hordes. Privacy, with encryption on disk and over the Internet, as well as a private database and web application for each customer maximizes your security while minimizing exposure through accidents, hacking or theft targeted at big data aggregators. Your contracting system should carry your brand, not ours. Viral marketing to promote our technology shouldn't be your priority, and it's not ours. We do thrive on referrals and hope to win your approval and recommendation. No spamming or marketing based on your usage and who you conduct business with. Such metrics and data mining belong to you, not your vendor. Encryption, digital signatures and document formats should use industry standards for quality, longevity and utility even if you decide to no longer use the software in the future. Technologies change but your documents and data need to be accessible to you as long as want it, not just as long as you continue to pay. Do it yourself is always an option and even encouraged to keep you in control and highly flexible. Everything is configured online. Subscribe to eSignForms on a monthly basis. Subscribe to Signed & Secured on a monthly basis. © 2000-2019 Yozons Inc. All rights reserved. The Original, Professional and Enterprise electronic signature and paperless web contracting solution since 2001.